This recipe has been in chef Roland’s repertoire for over 30 years and never loses its appeal. Light but with deep chocolate flavor. Utterly divine as it melts on the palate. No stabilizers, additives or fake anything. 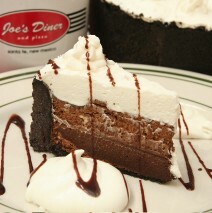 Quality French chocolate and real heavy cream are the foundation for this perennial Joe’s best seller.